Annette comes by her generosity honestly. She remembers how her parents would welcome neighbors into their home to share food — no one thought they would ever go hungry. These days, Annette’s continuing her family’s legacy of generosity as a dedicated Philabundance volunteer. She came for her first shift in 2011 and quickly made friends on the warehouse floor. Before she left for the day, she already signed up for another shift! She says her volunteer team has become her family, and she’s proud of what they’re able to accomplish together. 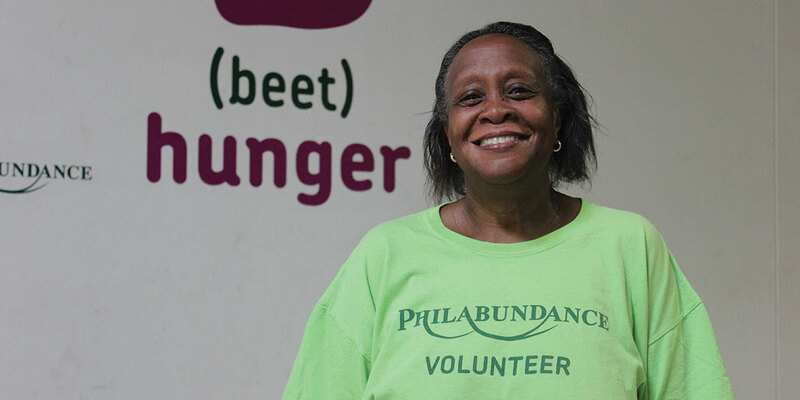 She regularly gives her time helping to sort and package items at our Hunger Relief Center in South Philadelphia and has recruited coworkers from her job at Pearson to join her. Annette says her choice to fight against hunger was simple; She was taught to do what’s right and necessary, and she saw the need in her community. Our work would not be possible without gracious people like Annette who give their time to improve the health of our community. Our sincere thanks go out to Annette, her team and her recruits for their tireless efforts to drive hunger from the communities we serve. Sign up for a volunteer shift.